Tonight I was lucky enough to have guided/captained woman angler Maureen Klause to another line class record. This is far from our first IGFA World Record, but this one was particularly special. 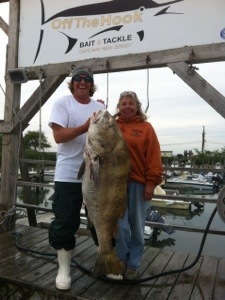 Mo has been trying to get the Black Drum record on 4# test for over 5 years and tonight she accomplished exactly that! Congratulations Mo!!! I’m stoked I got to be a part of this one. We slipped out around 1:30 after getting our clams from Off the Hook. With the Memorial Day crowd we ran to the DE Side to get away from the fleet. Trying to chase a line class record fish through a fleet is super difficult. We started out on the edge about 2 miles South of the Coral Beds towards the end of the outgoing tide with 60 degree water temperature. The water was pretty dirty from the front we had all weekend and it made it difficult to get marks on the sounder so we had to setup blind. All we had were dogfish so we slipped up into the Coral Beds in 13 feet of water and setup. Game on. We had a solid drum on that we chased for a while. It was a nice fish and I could not get it off of the bottom every time I grabbed the leader. Finally I got the fish to move and played a little give and take then as I was letting the leader slip through my glove it got caught on the foam and mesh part of my glove, completely caught the leader and POP. Needless to say I was pissed. Stupid problem to have and it cost us a record fish. I felt really bad because as bummed as I was I knew Mo had to be upset on that one. Anyway we got back on the ball and Mo caught two smaller drum shortly after. At the bottom of the tide she got into her fourth drum and we chased it for a bit. After about 20 minutes of Mo doing battle and me playing tug of war on the leader with the fish about a dozen different times, the black drum decided to come up show is its size, and I will never forget the image I saw. I yelled, “This is the one!” After another 20 seconds of gingerly pulling it within the gaffs reach, I slipped the meat hook right under the chin and on the deck of Maureen’s Contender it went. It was obvious this would beat the standing record of 40lbs and change. Congratulations on a great fish and technique. Glad I found your blog linked on Chuck’s facebook page. Nice work. Thanks for the good words! It was a fun catch for sure!